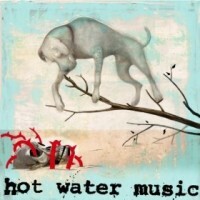 Album Review: Hot Water Music - The Fire, The Steel, The Tread/Up To Nothing 7"
Despite being out of the game for quite a tat, fans have never really forgotten about Hot Water Music. Truly, the myriad of bands who cite them as an influence have not forgotten them either, as Hot Water Music have left a crater-like impression on the modern day punk scene. HWM have been releasing music here and there since their last full-length album, The New What Next, but nothing in the form of a true follow up. The Fire, The Steel, The Tread/Up To Nothing 7" isn't simply a two song collection, but rather, the promise of what is to come, as the band are currently working on a new record. Still, not to be outdone by such momentous news, the 7" is a delight all by itself. Sure it's incredibly brief, but it's a wholly enjoyable, hard hitting work that more than lives up to the name of Hot Water Music. The big drawback here is its brevity. It's somewhat difficult to complain about this, as it's not exactly disguised as anything more. HWM have created two fantastically solid songs that are both familiar and new, all for their fan's enjoyment, as well as to stoke the fires of anticipation. Needless to say, after hearing the moody, rocking "The Fire, the Steel, the Tread," and the smooth but heavy "Up to Nothing," it's hard not to be wonderfully excited for what's to come. The Fire, The Steel, The Tread/Up To Nothing 7" is an awesome way to spend six and a half minutes, whether you're a fan or not. It's a solid, enjoyable pairing of songs that gets this reviewer more than stoked for what's to come.